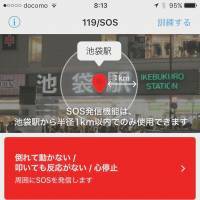 Tokyo-based social venture Coaido is launching an iPhone app that helps bystanders assist as effectively as possible in the crucial few minutes after a cardiac arrest. The app prompts the user to send an SOS to people trained in cardiopulmonary resuscitation (CPR) nearby, checks whether they have already contacted the emergency number, 119, and connects them with facilities where automated external defibrillators (AEDs) are available. Coaido CEO Makoto Gensho, 36, came up with the idea for the app in 2013 at a “hackathon” software programming event, and founded the company in 2014. He has since enlisted support from people with medical expertise — including Takahiro Ozawa, a paramedic with 10 years’ experience in ambulance care and eight years teaching paramedical students — to develop and improve the all-in-one app. Ozawa stresses that the odds of survival fall if no action is taken until the ambulance arrives. According to 2016 Fire and Disaster Management Agency (FDMA) statistics, it took an average of 8.6 minutes for an ambulance to arrive after an emergency call was made. Experts say that without resuscitative efforts, a person’s chance of survival falls by around 10 percent each minute. 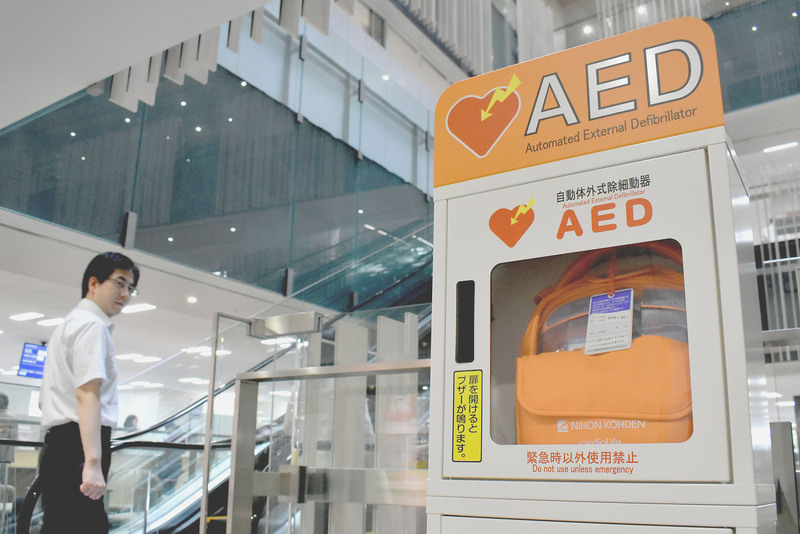 As such, it’s extremely important that citizen volunteers do all they can to help — to give a heart massage to someone who is unconscious and attach an AED — without waiting for an ambulance, Ozawa said. That’s where the app, Coaido 119, comes in. When a user launches the free app, the “self-triage” screen shows up. At the top of the screen is a red section. A user is urged to tap the section if someone is unconscious and does not respond even on contact. The app then shows a map of the user’s present location, with a small pop-up window to show a real-time video of the location. The app then displays the number of pre-registered volunteers capable of offering CPR nearby. The user can send an SOS to these CPR-capable volunteers, who include doctors, nurses, paramedics, police officers and others who have registered beforehand with certificates of their CPR training. The app also checks that the user has called 119. The sender of the SOS can communicate with the registered volunteers through video, voice chat and text messages. 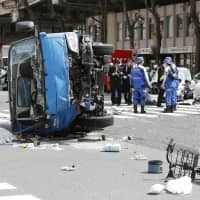 “Our goal is for three to five certified helpers to arrive at the scene within two to four minutes,” Ozawa said, noting that the more quickly first action is taken, the greater the chances of survival. 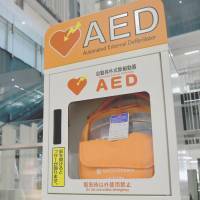 In 2015, of the 24,000 people across Japan who had cardiac arrest and whose condition was recognized by those around them, only 13 percent survived and just 8.6 percent had returned to normal lives a month after their heart attack, according to the FDMA. In addition, the app automatically contacts nearby facilities with AEDs, so someone from those facilities can bring a device to the scene. Coaido 119 directs users to other agencies in less serious cases, to steer people away from calling ambulances unless absolutely needed. 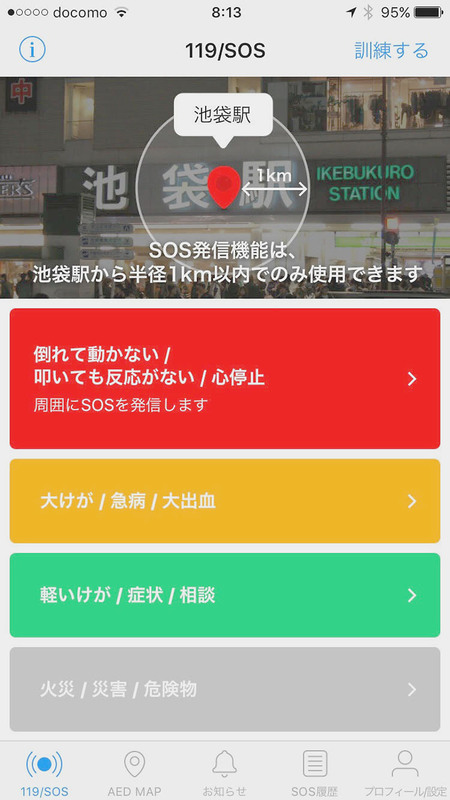 For example, a section of the app’s self-triage screen, colored green, shows what to do with “light injuries.” By tapping the screen, the user can dial #7119, where an operator asks a series of questions to determine whether the caller really needs an ambulance, or calls a 24-hour hospital information service (for Tokyo residents only). 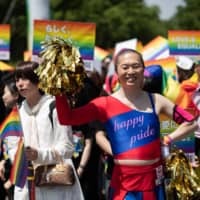 Late last month, with funding from the industry ministry-affiliated Information-Technology Promotion Agency, the firm started testing the service in Toshima Ward, Tokyo. The app can be activated within a radius of 1 kilometer around JR Ikebukuro Station. So far, 90 people have registered for the six-month-long project as potential senders of SOS messages, among whom around 30 people are also registered as CPR-certified responders. Yuuki Imaura, director-general of the Toshima Ward disaster prevention/crisis management division, rates the app highly. He added, however, that getting more people to enlist as users of the service will be key. “We need at least 10 times more registered users,” Imaura said. “By getting qualified professionals to participate, I hope the ward will see a dramatic increase in the use of AEDs and the number of lives saved,” he added. Coaido, which has received funding from investment firm Mistletoe run by Taizo Son, aims to contract with municipal governments to offer its services. 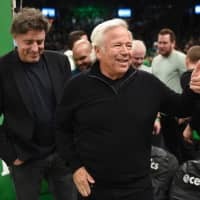 Gensho said the firm also wants to promote the app to developers of high-rise condos, where ambulance crews have difficulty reaching residents on upper floors. Gensho added that he hopes to see citizen-driven pre-ambulance response take root ahead of the Tokyo 2020 Olympics.